Le nozze di Figaro (The Marriage of Figaro), opera, K. 492: Act l. Aria: "Non so più"
Le nozze di Figaro (The Marriage of Figaro), opera, K. 492: Act ll. Aria: "Voi che sapete"
Così fan tutte, opera, K. 588: Act ll. Aria: "E' amore un ladroncello"
Don Giovanni, opera, K. 527: Act ll. Aria: "Vedrai, carino"
Le nozze di Figaro (The Marriage of Figaro), opera, K. 492: Act lV. Recitativo & Aria: "Giunse alfin il momento...Deh vieni"
La clemenza di Tito, opera, K. 621: Act. l Aria: "Parto, parto"
La clemenza di Tito, opera, K. 621: Act. ll Aria: "Deh, per questo"
Wolfgang Amadeus Mozart. Very Good. In very good packaging. 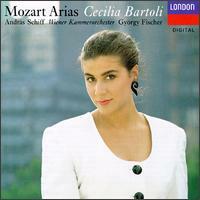 Gyorgy Fischer-Mozart Arias; Cecilia Bartoli by Gyorgy Fischer. Very Good. 028943051323 100% GUARANTEED. CD IN MINT CONDITION SHIPS FIRST CLASS. Very Good. Music CD. Disc in very good condition with minimal wear, plays perfectly. Case and inserts show signs of wear. Stored in sealed plastic protection. In the event of a problem we guarantee full refund. 1992. Music CD.